In the previous articles, we have learned the basic aspects of the JDBC specification and the implementation of the PostgreSQL driver. In this article, I’d like to go on checking another important part of the JDBC specification(JDBC™ 4.1 Specification): Connection pooling. 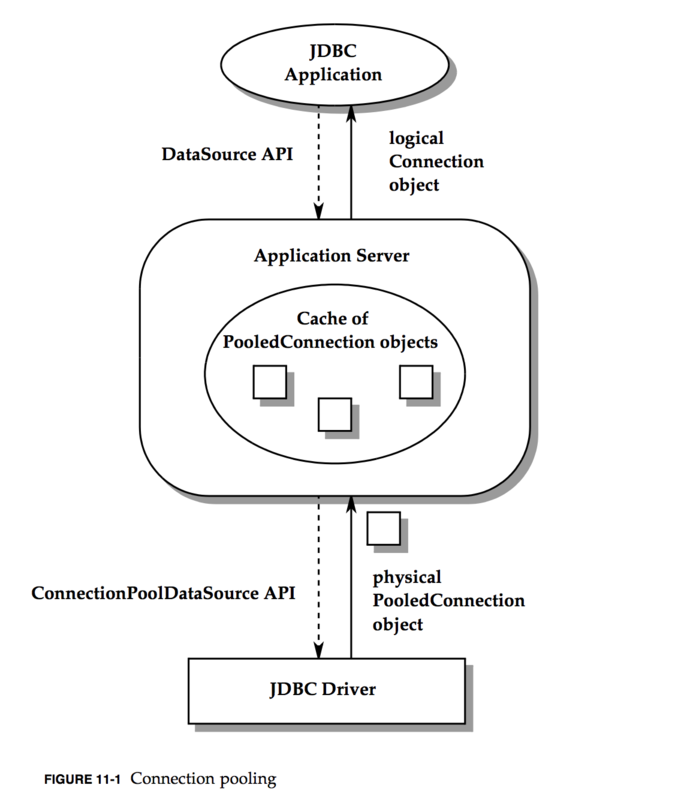 The above diagram shows the two interfaces from JDK source that should be implemented by the JDBC driver, which are javax.sql.PooledConnection and javax.sql.ConnectionPoolDataSource. 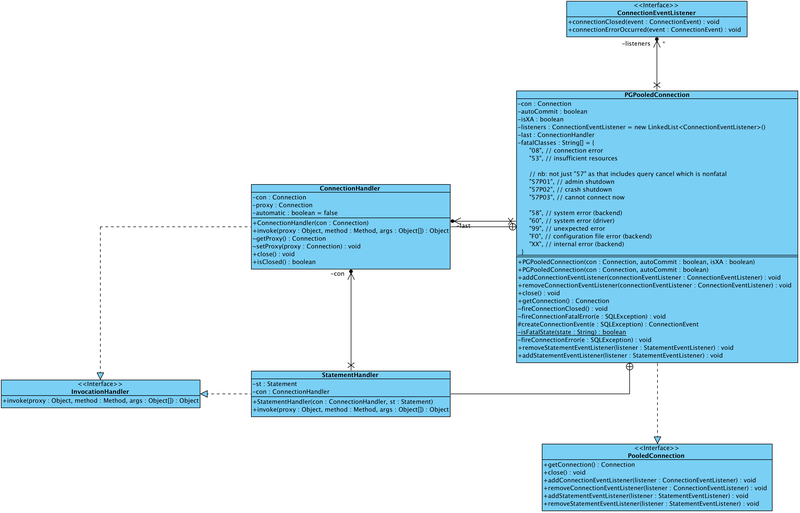 From the above diagram, we can see the ConnectionPoolDataSource interface defines a getPooledConnection() method that will return a javax.sql.PooledConnection typed data. The PooledConnection interface defines the getConnection() method that will return a java.sql.Connection typed data. The purpose of the design is to allow the implementation of the PooledConnection and ConnectionPoolDataSource to manage the underlying Connection to the database. In this way, the JDBC driver can handle the Connection instance returned from PooledConnection to manage its lifecycle the data pool. The above diagram shows the implementation of the interfaces in the driver. The org.postgresql.ds.PGPooledConnection implements the javax.sql.PooledConnection interface, and the org.postgresql.ds.PGConnectionPoolDataSource implements the javax.sql.ConnectionPoolDataSource. We will check the design of these two classes later in the article. These two interfaces do not care about the detail pool implementation, and usually in application server the connection pool implementation can be configured and replaced with multiple choices. In this article, I won’t use an application server as the datasource provider. In PostgreSQL JDBC driver, it provides a sample pooling implementation class named org.postgresql.ds.PGPoolingDataSource. We will use it as our demonstration implementation in this article. * Created by weli on 01/05/2017. From the above output, we can see a wrapper proxy instance around org.postgresql.jdbc.PgConnection being returned to the user. From the users perspective, they don’t care about the implementation of the connection instance, they will just use it as an ordinary connection interface and call the methods to operate on the database. If users call the close method of the connection, it will actually be returned to the connection pool instead of really being closed. This is implemented in the org.postgresql.ds.PGPooledConnection class. 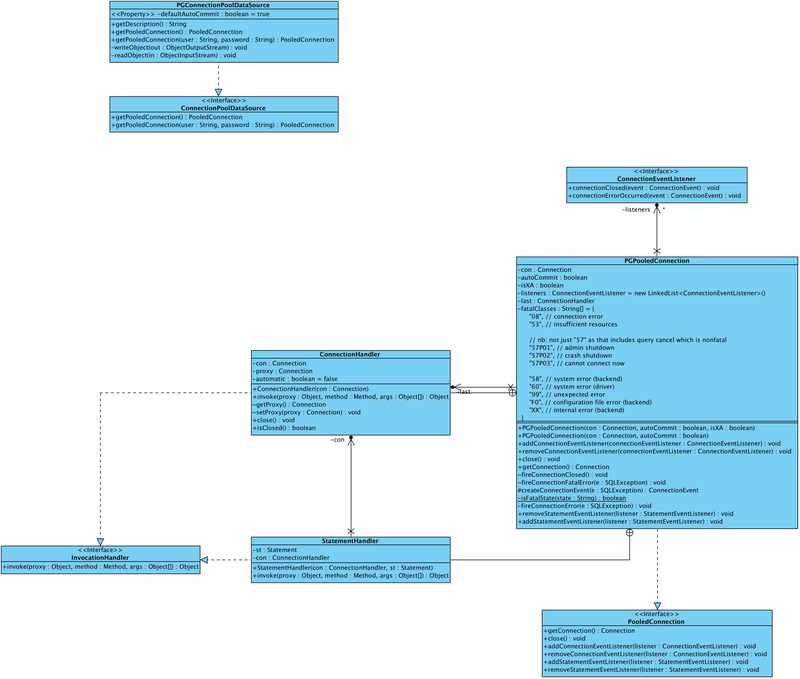 From the above diagram, we can see the connection instanced is proxied, and it is actually the inner class ConnectionHandler inside the org.postgresql.jdbc.ds.PGPooledConnection class. From the above screenshot, you can see I have set the breakpoint at the conn instance returned from the data source. 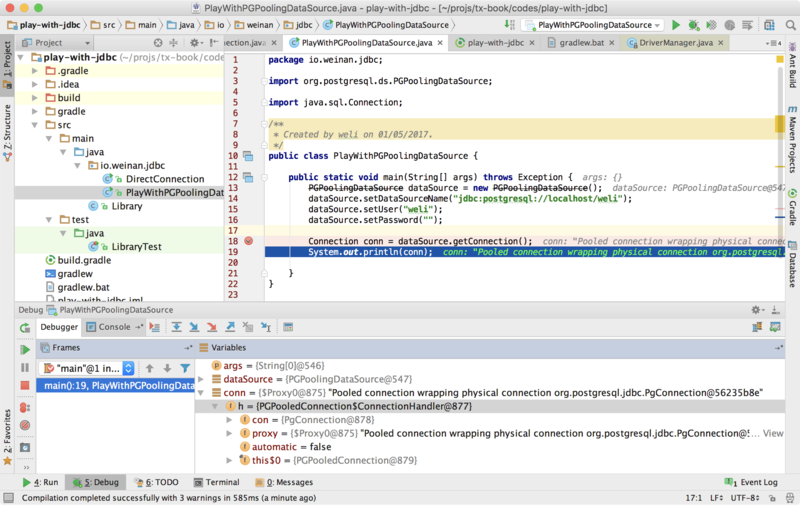 In the inspection window of IntelliJ IDEA, we can see the real class of the conn is PGPooledConnection$ConnectionHandler. Remember that conn has the type of java.sql.Connection, so the users will just treat it as ordinary connection to the database. The job of PGPooledConnection$ConnectionHandler proxy is to dispatch the calls to the org.postgresql.jdbc.PgConnection that makes physical connections with the database server. org.postgresql.jdbc.PgConnection is the class that implements the java.sql.Connection interface, and it will make the physical connection with underlying database system. The org.postgresql.ds.PGPooledConnection$ConnectionHandler proxy will handle the org.postgresql.jdbc.PgConnection. Now let’s check the code of the org.postgresql.ds.PGPoolingDataSource class to see how it manages the lifecycle of the physical connection. // is not an error. // and check if they're fatal before rethrowing. * Used to fire a connection closed event to all listeners. From the above code, we can see the fireConnectionClosed() method will create an instance of ConnectionEvent class and register it into an instance of ConnectionEventListener, and finally the listener will fire the connectionClosed(...) event. 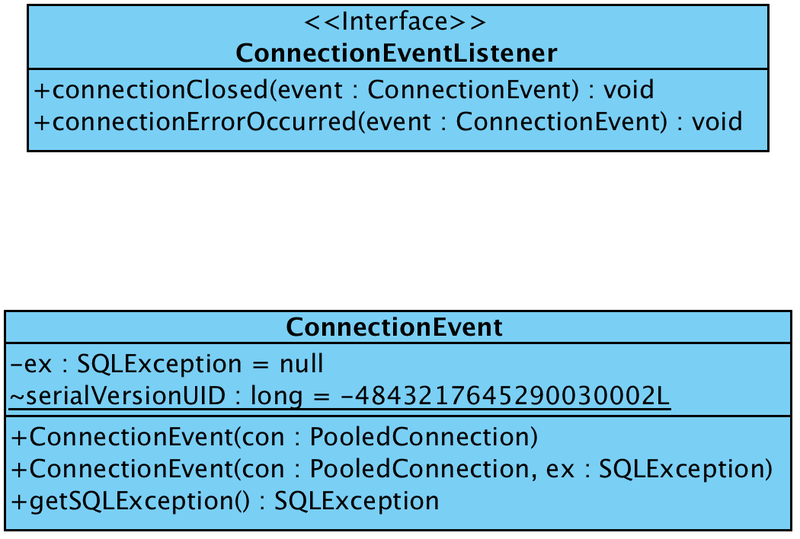 The ConnectionEvent and ConnectionEventListener are two interfaces provided by the JDBC specification, and it is the container’s job to implement them properly to handle the event in a pooling environment. For example, in the PGPoolingDataSource demo datasource implementation, it will just return the connection back to its pool instead of really closing it. In the real container like Wildfly, it will rely on its pooling provider to manage the events (Apache Commons DBCP is a popular connection pooling provider used by many application servers). We will check the detail of the PGPoolingDataSource later in the article. From the above diagram, we can see the main job of the ConnectionEventListener interface is to handle the connectionClosed(...) method, and the ConnectionEvent will be passed in as the context. Now we need to check the implementation of the PGPoolingDataSource to see how to implement a pooling data source. From the above code, we can see an instance of PGConnectionPoolDataSource that implements the javax.sql.ConnectionPoolDataSource interface is stored. 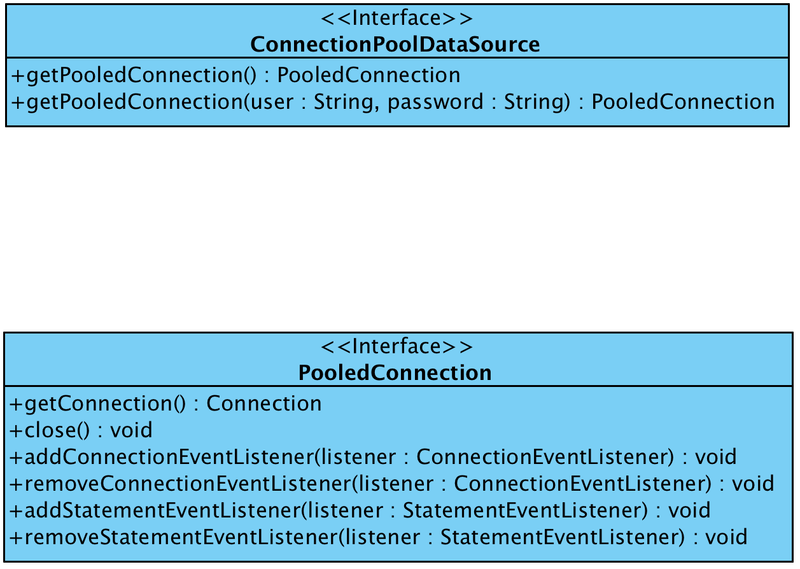 Let’s now review the usages of ConnectionPoolDataSource interface: it defines a getPooledConnection() that will be used to return a javax.sql.PooledConnection, and the javax.sql.PooledConnection will return a managed Connection instance from the pool. In PostgreSQL driver, the org.postgresql.ds.PGPooledConnection implements the javax.sql.PooledConnection interface, and will return a ConnectionHandler proxy class that wraps around the physical org.postgresql.jdbc.PgConnection instance. Next, the ConnectionHandler proxy will wrap the connection methods with event listener, and the event listener will be handled properly by the pooling vendor. Our pooling vendor is PGPoolingDataSource, which is a demo class to show how to implement a data source pool. * connection from the DataSource. *         DataSource is not able to create enough physical connections. The above logic is very low efficient, that’s why this PGPoolingDataSource class is just for demonstration and can’t be used in production field. In application server, we’ll have more powerful connection pool solutions. The above code shows the new connection is created and pushed into the used stack. Now we know if the connection is being used by a thread, it will be kept into the used stack. * Notified when a pooled connection is closed, or a fatal error occurs on a pooled connection. * This is the only way connections are marked as unused. * should be removed from the pool. From the above code, we can see that when a pooled connection is closed, it will be returned back to the available pool and removed from used pool. The connection won’t be really closed actually. * Adds a listener for close or fatal error events on the connection handed out to a client. * Removes a listener for close or fatal error events on the connection handed out to a client. * Used to fire a connection error event to all listeners. From the above code, we can see the listeners are stored in listeners linked list. These methods will be called in the inner class ConnectionHandler, which is the proxy class represents the connection as we have seen. We can see the fireConnectionClosed() is called when the user invoke the close() method of the connection. * are optional. Note: these properties are declared in the superclass. From the above code, we can see the PGSimpleDataSource is just a thin layer that didn’t provide any data source pool inside. In this article, I have showed you the JDBC connection pool design, and we have checked a demo implementation of the architecture. We can see the whole design is very flexible, it decouples three kind of people: the user of the data base, the data base driver developer, the connection pool provider. We haven’t checked the real connection pool provider in an application server. For example, Wildfly uses Apache Commons DBCP as its connection pool provider. I plan to write article to introduce the data source in Wildfly, but it will be out of the scope of this series of the articles. In the next article, I’d like to introduce the transaction aspect of the JDBC specification.